While I do believe American Standard Heating and Cooling equipment is the best conventional equipment I am happy to service or repair any make. "In 2010, American Standard Heating & Air Conditioning is ranked highest in overall dealer satisfaction for the fourth time, after achieving the honor in 2006, 2007 and 2008. * "
"In May of 2012, readers of a national product testing and research magazine rated American Standard Heating & Air Conditioning’s air conditioners and heat pumps as the most reliable brand among leading manufacturers." 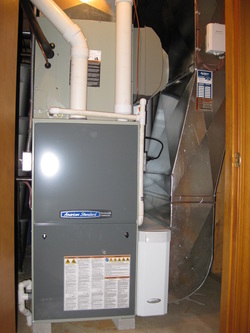 This picture shows a 97%, two stage, variable speed furnace, the indoor portion of the heat pump system, a custom return air elbow with turning vanes, and an offset directly above that. The elbow does not have a filter slot because it is secured to an Aprilaire whole house media air filter. Right above the filter is an American Standard humidifier.